In the 1920s and 1930s, France, like the rest of Europe and America, suffered from hyperinflation during the Great Depression. The middle class was hardest hit as they resorted to selling personal belongings and treasured heirlooms that had been in their families for generations. Devastated, they looked for someone or something to blame for their misfortune. The French blamed their existing government, The Third Republic. As a response to the economic crisis, there was a strong political reaction all over Europe that pitted an extreme right against a radical left. The far right in France was an alliance between, Action Française, the Parti Populaire Française (PPF) and the Croix de Feu. These groups exuded an aggressive nationalism and hated parliamentary governments, Communists, and were extremely anti-Semitic and xenophobic (particularly against Eastern Europeans). The goal of the fascist right was to re-establish a "True France" - one in which each individual was Catholic, and of French soil (and preferably had been for generations). By the 1930's, 7.5% of France's population was immigrants (the highest percentage in Europe), while the population of the "True France" was on the decline. These statistics certainly fanned the flames of the xenophobic right's fire. In February of 1934, tensions came to a head as a result of a scandal known as the Stavisky Affair. An Eastern European Jew immigrant, Serge Stavisky, had embezzled millions by selling fake municipal bonds. When some officials from the Third Republic were allegedly linked to the scandal, Stavisky wound up dead and the far right was in an uproar and held violent riots in the streets of Paris. One failed coup d'état, fifteen dead people, and one resigned Prime Minister later, the left stepped in to save the Republic. The left, which became known as The Popular Front, was an alliance of Socialists and Communists who were predominately middle and working class. Their goal was to save the Republic from the fascist right. Their leader, Léon Blum, was a Socialist and a Jew. The Popular Front won the 1936 elections, and Blum became Prime Minister. Although its tenure was short-lived, they did legislate improvements for the working class. By 1939, the Popular Front was alive in name only. France was at war and moments away from Nazi Occupation. Leaders of the right would find camaraderie with the Nazis. 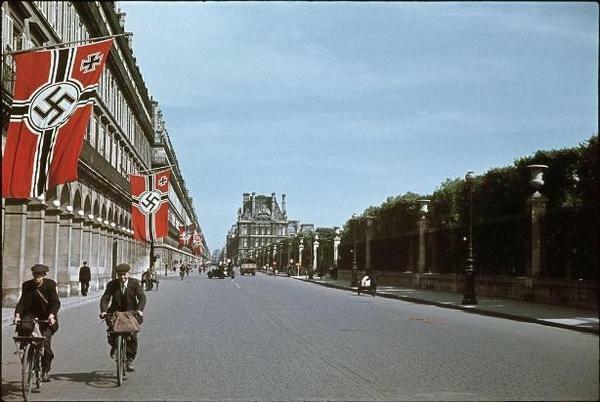 In early June of 1940, the Nazis were on the doorstep of Paris. Fearing for their lives, many Parisians made a mass exodus out of the city, carrying with them the bare essentials. Many didn't even reach their destination before France surrendered. On June 14, 1940, France fell to the Nazis, and by June 22nd, had formally surrendered. 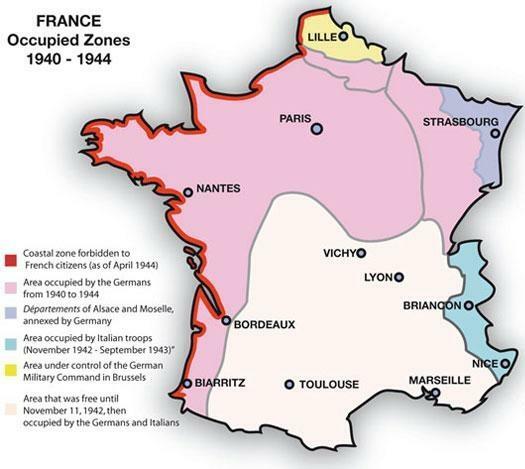 France was swiftly divided into two zones: the Occupied Zone in the north, and the "Free" Zone in the south, also known as Vichy France. Paris' government fled, predominately to London, shortly before the Nazis seized the city. The exiled government worked closely with the Allies with the goal of liberating their beloved France. 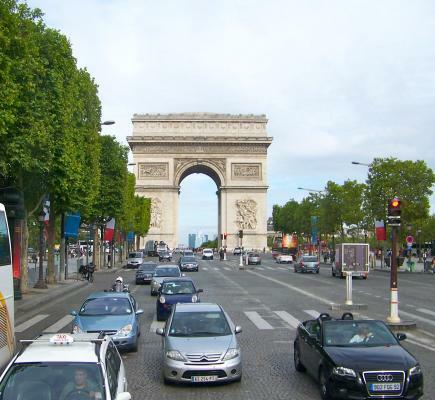 This is a virtual tour about the life and times of Paris during the Nazi Occupation. For some, the occupier was merely an inconvenience. For others, Nazi presence would cause indescribable hardships and loss over the span of the four year occupation. Either way, Paris and her people would never be the same. "Was there not some Greek myth about the man who tried to ravish the goddess, only to have her turn to stone when he touched her? That is literally what has happened to Paris. When the Germans came, the soul simply went out of it, and what is left is only stone." The above newsreel video of the surrender of France is from Marcel Ophüls' 1969 documentary, Le Chagrin et la Pitié. Note the change in the tone of music when the black, Asian, and Maghrebian soldiers are shown.